E-GCPM is now open for enrollment. Click here to read more or register for the new program --- E-GCPM (Extended Gelfand Correspondence Program in Mathematics). In memory of ISRAEL GELFAND, a Fund was created at PCRM, called The Israel Gelfand Memorial Fund for Ethical Bio-Medicine. We are collecting related to Israel Gelfand articles, photos, stories and memories shared by his students, colleagues, friends or other people who met him and were affected by him. If you would like to contribute any materials, including internet links related to Israel Gelfand, please, email: Tatiana V. Gelfand (atatiana7 <at> gmail.com) or Tatiana I. Gelfand (tatiana.x <at> gmail.com). We will also appreciate clarifications and valid corrections on any factual information posted on the site. This site is dedicated to Israel M. Gelfand. The idea of this site came suddenly on October 6, 2009, the day after Israel passed away. While searching the web about Israel Gelfand, we found that Gelfand in Yiddish means Elephant. Someone on that site asked why a person would have such a name. There is an Indian parable about the Blind Men and the Elephant. Six blind men wanted to learn what an elephant was. Each one touched a different part of the elephant's body and claimed to know what an elephant was. And although each was partly right, not one of them had grasped what is an elephant. We hope to shed light on the life, work and personality of Israel Gelfand by putting together different materials based on our vision and understanding of this remarkable scientist and human being. Israel Gelfand is considered to be one of the greatest mathematicians of the 20th century. He made major contributions to many areas of mathematics. His achievements also include well-known work in biology, and works done together with medical doctors. Gelfand published over 800 papers and 30 books. Besides scientific work, Israel Gelfand is known for organizing and leading two world-wide known seminars in Moscow: one in mathematics and another in biology. 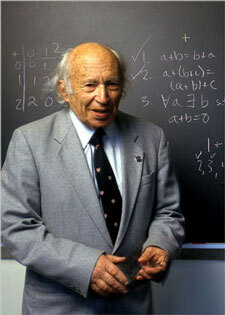 He mentored a large number of students, many of whom became well-known mathematicians themselves. Gelfand made a significant impact on education by organizing a Correspondence School in Moscow (called currently VZMS) and the Gelfand Correspondence Program in Mathematics (GCPM) in the USA. He also wrote a number of educational books for students. Gelfand received numerous prestigious awards and honors for his outstanding contributions to the field of mathematics. One of his awards, the Kyoto Prize, is given for significant contribution to the scientific, cultural and spiritual betterment of mankind. At the award ceremony in Kyoto, Gelfand gave a talk on Two Archetypes in Psychology of Man. This was one of the very few times he spoke publicly on general topics. He presented some of his views on mathematics and other sciences and their place in the development of mankind. In all his work whether in mathematics, biology or other fields it was always essential for Gelfand to reflect on the broad picture. This included not only the connections between areas of mathematics but also connections going beyond a particular field. This wholeness defined to a large degree his approaches and the directions he took in his work. When we decided to open this site about Gelfand with the idea to describe "what an elephant is" (see the legend), we immediately faced many difficulties. First difficulty, who except the elephant himself can truly know what an elephant is? We decided that we would structure our site around what Israel himself said about his work, his ideas, and his vision. Unavoidably, we will have to refer to our own memories and perceptions. But in doing so we will try to "serve soup and flies separately" - that is to keep facts and Gelfand's own words separate from their interpretations by others. Second difficulty, what is the appropriate way to speak about a human being, to describe Israel Gelfand? Gelfand's views, partially expressed in his Kyoto lecture, are that mankind has yet to find an adequate language to speak about human beings, values, relationships and communication. In this regards, we view our attempt as an exploration rather than a finished and "correct" description of a famous person. The site is organized and maintained by Tatiana V. Gelfand and Tatiana I. Gelfand.